June 28th, 2016 ~ In a very close USPA NYTS match this past Thursday, NYTS team Maryland Polo defeated NYTS Quiet Creek Farm in a “shoot out” for the win! Winners pictured here: Abbie Grant, Lila Bennett, Parker Pearce, Sophie Grant. 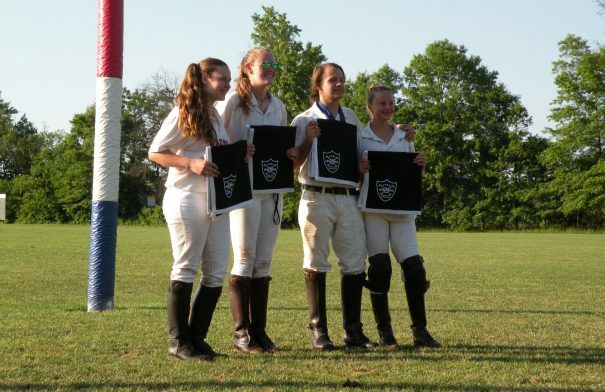 Three NYTS teams competed, Maryland Polo/Quiet Creek Farm/Goose Green, all mostly comprised of Maryland Polo Club’s youth members. During the six chukkar youth match all games were extremely close. At the end of six chukkars Quiet Creek Farm and Maryland Polo recorded a tie score. In order to break the tie score the USPA requires a “shoot out”. Team captain, Maddie Grant, rocketed one goal for Quiet Creek Farm. However in the end, Sophie Grant and Maryland Polo team captain Parker Pearce nailed their shoot out goals earning the win for Maryland Polo Club.